Eddyfi® Technologies has released Panther, an ultrasound imaging machine. Panther comes with M2M’s state-of-the-art phased array ultrasonic techniques (PAUT) and total focusing method (TFM). Panther is a phased array equipment designed for both desktop and industrial applications, offering unparalleled performance in a compact unit. It combines the speed required for industrial integrated PAUT solutions, with the most complete set of TFM imaging techniques, making it the ultimate tool for R&D and procedure qualification. This first release of the Panther targets laboratories and R&D groups, thanks to its super high-resolution imaging, with 1.5+ million pixels in real-time and a data throughput greater than 320 MB/s. Combined with its operating software Acquire, Panther is a fast and versatile PAUT/TFM solution available on the market. Soon, Panther will offer high-speed inspection modes, targeting integrators for advanced industrial NDT inspections. Taking advantage of its parallel and stackable architecture (up to 16 units of 128 channels each), Panther will meet the speed and resolution requirements of the most demanding applications. “Panther is the result of over 15 years’ experience gained in both laboratories and inline inspection business by our experts. 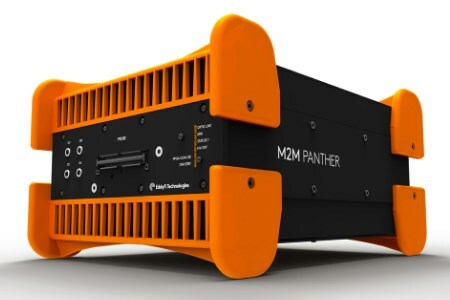 Panther has been designed with tremendous processing power and a high data throughput between the instrumentation and the monitoring computer. It aims at meeting our customers’ highest expectation and needs. The recent rise of graphics processing unit (GPU) computing power in a compact, industrial and affordable format, allowed us to provide a very flexible solution for both laboratories and industrials. Panther bridges advanced phased-array methods such as TFM with the high-speed ultrasonic inspection requirements of the industry” said Laurent Le Ber, Eddyfi Technologies Product Manager for Panther. Panther is compact and scalable from 32:128 to 2048:2048 channels. The CIVA-based ACQUIRE operating software, and its extensive software developer’s kit (SDK), allows for fast, advanced and customised configurations. ACQUIRE inspection data files are fully compatible with ENLIGHT, CIVA and ULTIS analysis software.